Blog A Carb-Loaded Youth, Years of Hypoglycemia & How I Landed on a "Paleo" Diet. Updated: Monkeying around at LAX CrossFit – 2011. Here's an honest look at how I landed on a paleo/primal type of real food diet. I say “Paleo” in the title of this post because I don't follow one specific diet 100% of the time, but I do what feels best for my body and what works for me intellectually as well as physically. My story is far longer than this post, but I kept it as brief as possible- enjoy! I’m relatively new to Paleo (I think I first started the transition mid-February of this year – 2010), but I can already tell I’ll be a “lifer.” I feel so grateful to have stumbled across this way of living and eating at this time in my life. I am sure I would have gotten here sooner or later, but I am a firm believer in things happening for a reason and that when the time is right for people to hear the message, the message presents itself. And boy, if there was ever a time for me to get a clear message about yet another life-change, it was now. The fact that I’m someone who loves to shake things up and change my life around often is information for another post entirely. That said, I’m going to do my best to keep this story as succinct as possible, but as you probably all know, it’s been a long journey. Mine began as far back as high school, when I can remember food being an issue for me. Maybe some of the things I’ll talk about will resonate with you, or you’ll see yourself in my story, or maybe my story is so different from yours that it’ll astound you that we landed in the same place. Whatever reaction you have, please share it with us all in the comments below. As a result of my journey, I’ve developed The 21-Day Sugar Detox Manual to help jump start those looking to kick their sugar and carb cravings. It’s a perfect way to ease into the Paleo world if you haven’t yet, or to make some more positive changes if you already have. The 21-Day Sugar Detox manual is filled with lots of tips and tricks, information on good fats vs. bad fats, names sugar hides under in ingredient lists, and tons of recipes (all Paleo-friendly) to get you going. Foods I ate: Whatever I wanted, home cooked meals, some processed food, lunches at school grades 6-8 were French fries and chocolate chip cookies (yes, really). How I looked: I was a pretty thin kid, I never had weight problems and don't remember even ever thinking about it much. How I felt: It was so long ago, who can remember? 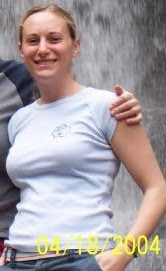 How I looked: I was in pretty good shape as an athlete, but looking back at photos reveals a face that was still pretty round with “baby fat.” I remember wishing I could lose weight or be thinner somehow at this point, but I was never really on a diet or trying to do anything about it. How I felt: I was an athlete. I ate what I wanted, when I wanted. I drank lots of Gatorade and picked up a coffee habit. I felt okay, I didn't know any better. I was “always hungry” and started to carry snacks everywhere at this point. I would be sure to eat pretty soon before practice or a game so I didn't get light headed. I think this was Christmas, 2001. At my heaviest, 165#. I am 5'4″ tall. Foods I ate: Freshman and sophomore year I chowed on pizza, wings, fast food, cafeteria food with the obligatory salad bar – which I enjoyed but I wouldn't say it was the main source of my food. Once I moved off-campus, I cooked hot dogs, mac & cheese, pasta and probably some frozen veggies from time to time. How I looked: I started to pack on the pounds little by little. I wasn't working out at all and I bought bigger clothes year after year. My face was getting rounder and my body was just getting a little bit bigger all over the place. I didn't really notice it too much since it was gradual. How I felt: I had a boyfriend and didn't think much about my weight at the time. I knew my older clothes didn't fit, but my boyfriend was a bit big himself, so somehow that balance didn't leave me feeling too badly about the weight gain. I wasn't moving or being active at all besides walking to class. I had lost touch with my inner athlete. On a camping trip in 2004, after I lost weight. Foods I ate: I learned about Weight Watchers, counted points, counted calories and fat and fiber. I ate more real, whole foods but also was eating a lot of packaged foods that were low calorie and low fat. I was really into keeping my fat intake low and had snacks on-hand at all times (usually chewy chocolate chip granola bars). How I felt: I felt happy and confident. But I also felt hungry almost ALL of the time. My friends joked about having to carry snacks for me, so I didn't get too starving and turn cranky! Many of my friends never considered me to be a bigger person, but after having gained the weight, I now had a sense that I was always going to feel like a “fat girl” despite my more lean appearance. Foods I ate: After a year of being in San Francisco and working with a personal trainer, I was still eating a low-fat diet and worked hard at choosing foods that wouldn't have too many calories in them. Chicken breast, veggies and whole grains were staples for me. Organic foods were just coming into play early on and by '07 I was eating nearly 100% organic. How I looked: I began to change the shape of my body and gained muscle. I got stronger and leaner and started to look on the outside the way I felt on the inside. I completed my first 1/2 marathon and felt really strong. I learned shortly thereafter that endurance athletics weren't for me and pursued strength training to look and feel my best without working out so much. How I felt: I was loving working out and felt great about being such a “healthy” eater, but I was still hungry all of the time. I'd finish a huge plate of veggies with chicken breast cooked in very little oil and still be hungry and I still suffered from hypoglycemic bouts. Shortly after my first 1/2 marathon several serious injuries knocked me down, not the least of which was adrenal fatigue. Foods I eat: All organic whenever possible: lots of veggies, grass-fed/pastured meats, wild fish, some fruit and some nuts, coconut oil, olive oil, yada yada, you know the Paleo gig by now. How I look: As a result of beginning to attend classes at my local Crossfit gym combined with my Paleo diet, my body is regaining its once lean and muscular shape. I feel I've just begun this new journey and I'm tracking my progress. More importantly, however, is how I feel about how I look. I feel confident, strong and capable. Check out this little video on my YouTube page to see how I look these days (and you can tell how I'm feeling as well- this was SO much fun! ): Playing around at Crossfit KMSF. How I feel: To me, this is the most important part of the change in my diet. I NO LONGER SUFFER FROM HYPOGLYCEMIC BOUTS! Seriously. I've learned about the science behind why eating a carb-rich diet was making me feel awful (dizzy, light-headed, nauseous) and left me hungry or starving all the time. (Thanks to the nutrition program at Bauman College as well as Robb Wolf's Paleolithic Solution Seminar). I've learned how to balance my meals to leave me feeling satisfied, fueled and keep my body's metabolism in the right place. It's AMAZINGLY LIBERATING to not need to carry snacks everywhere I go. I now know that a proper meal will actually hold me for hours on end. I feel amazing. And I'm so happy that I've found a home with a Paleo diet. Thanks for reading my story. I hope to post on some other topics in the future, not the least of which will probably be SUGAR! Don't forget to check out The 21-Day Sugar Detox Manual if you're looking for some great information on how to kick that habit and curb cravings. Join the conversation over on the Facebook page as well. I'd love to hear what topics you want to read about in future posts. I'm always open to teaching people more of what they want to learn. i love your story, diane. keep up the good work! paleo is it! Your story is pretty similar to mine, except throw 3 kids in the mix and I ended up probably a little bigger than you were (size 14/16). I've been focused on whole foods now for about 3 years, its definitely been a journey, a little at a time. I have some pretty great recipes too if you ever want to share notes! I'm currently at a size 10ish, at 5 months postpartum, so I'd like to bring that down about 2 sizes. I'm very active and paleo-eating has been a recent newly found hobby for me….still struggling a little to cut out those fillers that I so happily recently incorporated into my diet (organic brown rice and grains). With the kids it is a little more difficult to do without those things as well. @Becca- I was about that size, too… 14/16… so I was there! As for feeding little ones, I'm working on a project right now that should help that- and you may want to check out http://www.everydaypaleo.com – she's a busy mom who makes it happen in her family! I love your story too – I'm BRAND new to Paleo (10/1) and already can tell that I'm not as hungry MOST of the time. I did notice when I had a glass of wine (3-5oz max) that my hunger spikes for a day or 2…or 3. 🙂 So, back to no alcohol at all. I've been weighing/measuring food since Jan, when I went mostly organic/clean. I still had Ezekiel bread, organic oatmeal and Organic Greek Yogurt. I cut the grains/dairy (never had many legumes) on 10/1. I lost about 22lbs since Jan…joined Crossfit and I'm up 5lbs. I know it's probably mostly muscle, but a bit frustrating. I'm still coping w/wanting to eat more and getting tired of the weighing/measuring, but scared to overeat. I may be petite, but I can put away some meat and veggies! Just getting a bit tired of feeling 'tied' to the food scale and my Excel spreadsheet. Love the site and the info – I've got my own blog, FB profile and Twitter account where I share my story too. It's great connecting w/fellow Crossfit/Paleo people! Thank you for sharing your story! Mine is eerily similar. I developed a thyroid issue and finally discovering Paleo has allowed me to feel alive for the first time in years! I have so much more energy and I have only been doing it for close to 3 weeks. Last year, I was running 5.5 miles/ 6 days a week and eating vegan, with only whole grains and little to no processed foods. I wanted to fall asleep while I was running and all of that exercise was only allowing me to maintain my size 12. It was beyond frustrating. I too have moved on to weight training. I have a lot of work to do. I had two sets of twins and my poor core was wrecked. The weight is coming off, albeit much more slowly than it is for my non hypo friends, and I feel so much stronger and just ALIVE. I was passing out daily on the couch for hours before Paleo. I am so happy to hear that you don’t have to carry around a snack anymore! Are you really on just the paleo diet that has been your glucose to level out? I would so love to not have to worry about carrying around a snack or worrying about when and what to eat next. I’m really encouraged by your before and after photos! Mainly for a funny reason, I suppose, because I have a round face that makes people believe I’m anywhere from 17 to 25 even though I’m 31 (small perk), but I would really like more definition. Although I think my face is rounder in bone structure than yours, I can’t believe how different your face shape is now compared to your heaviest photo! Super encouraged by that! ha! My history and body have some similarities to yours. I’m 5’4 and around 170 lbs now, but I was a skinny kid and thin in high school, until senior year when I started working in a bakery (access to all the wheat and sugar I could possibly want) and I went from 115 lbs to 135 in a year! In high school I, too, exercised constantly without thinking about it. In college my weight went up to about 160, which I blame on taking birth control for a year, loving the hell out of bread, and being semi-vegetarian (I tried full on veg for a month in 2000 but suffered from daily headaches). I was back down to 140 for a little while after college but have since regained the weight and more (of course..ha). My skin was always bad, mostly on my chin, until I finally threw in the towel and tried the generic version of Accutane in 2007, which thankfully worked. I had found a skincare line that really improved my skin (and my knowledge about skin and hair) in 2003, yet I still had breakouts that I couldn’t control (the line is called Paula’s Choice, btw – I’m always happy to recommend it because it’s amazing). Yet, other than being a bit tubby and having bad skin, I haven’t experienced other major health problems. I read about the Blood Type Diet in 2006 and started to reduce my wheat intake (and found differences in my poo when I was able to eliminate it for a few days! ), but never found the conviction to do it for any sustained length of time until this year, when I managed it for about 2 months, partially because I made a good friend who has Celiac. I’ve decided I really need to get back on that wheat-hating wagon, and also focus on your advice. I’m a researcher by trade, an ‘information scientist’ (basically a librarian) by degree, and I enjoy reading practically everything on a subject, but your book is my first paleo book! My research journey has wandered from Perricone to the Blood Type Diet to the Fat Head documentary to Gary Taubes to Wheat Belly to 4 Hour Body and a bunch of low carb blogs along the way. Although I’ve been aware of Paleo for awhile I haven’t paid much attention to it because of all the other things I was reading. However, my low carb stints haven’t gone all that well. I don’t know if it was a combination of moving to England and having a flatmate who brought home hospital germs or eating far too much cheese or stress from grad school or vastly increased alcohol intake compared to my life at home or (most likely) a combination of all of those factors that made me get a very bad cold for two months (!) this past winter. I used to very rarely get sick and never experienced any allergy symptoms. Maybe I’d get the flu every ten years and it would last a day or two, a cold every three years, and I never caught mono (I spent a summer with my best friend who caught it, sharing her cups and everything) or strep throat (my best friend also seemed to always have this) or any other contagious disease. My immune system could handle it all but suddenly I feel less than superhuman when it comes to fending off disease. I loved reading everyone’s story. I was an athlete in high school but you would never know that by looking at me. I would gain some weight, try to ‘diet’, gain more weight, give up and buy bigger clothes. I was really sick when I was pregnant with my son so, I didn’t gain weight (I was actually losing weight), but I gained 60 pounds after he was born. I found I was always trying some sort of diet but wasn’t able to lose the weight. I really wanted to have a second child so, I didn’t wait to lose the weight and again was sick all the time and didn’t gain weight (when I’m pregnant seems to be the only time I am able to lose weight). After my daughter was born, I again, gained 60 pounds……making me over 120 overweight. Again, I would try anything out there to try to lose weight and I would just end up gaining another 5-10 pounds. I am at my all time heaviest and really have to change my lifestyle as it is now affecting my 14 and 10 year old children……That’s an awfully long time to be carrying around my ‘baby weight’. I bought Practical Paleo yesterday and printed out my shopping lists today…….I have soooooo much to learn but I’m on my way! I saw your book today and of course was drawn to it instantly,it looks really fab and informative.I decided however not to purchase it YET as I already have gluten free,paleo and IBS diet related books at home and wanted to get some advise first.Let me tell you something about me.Im 39,mom to 2 kids,no previous health concerns other than anxiety and panic attacks.Im not on any medication as Ive managed to deal with it on my own and these days I only have have occasional attack,maybe 2 a yearand occasional heart flutter.Im 5`4 between 110-120 Ibs all my life.No known food allergies,I was a colicky baby born 2 months premature.Always been very athletic.For the last maybe 6 yrs Ive been experiencing a lot of intestinal discomfort.Some days Im fine others I get bloated with cramps,loud rumbling,it usually happens right after I eat a large meal and then maybe 30 min later goes away.A few times in a yr I get such bad cramps that I am bend over,it hurts to straighten,I can get sweaty and feel like almost pass out but as soon as I poop it goes away.My stool is always different.I don`t have diarhea but I get constipated.I can go 1 or twice a week,or 3 x awk or 3,4 times a day.Its always different.From few grape size pellets to pellets formed into a sausage or when Im travelling(thats when im most nervous) I can go 3x and very large snake like pieces.It might sound strange but I even showed it to my husband before who couldnt believe that such small person could produce such big stool!.Sorry for being gross.Last week I was on a lot of peppermint tea,which I drink everyday but my intestines were in a knot so I decided to try the IBS Heather Van Vorous elimination diet,Im actually easing into it but already feel a bit better laying off all the sweets and dairy.Im normally eating pretty well,only occasional red meat or fast food,no soda no coffee(no more than 2 a yr).I eat mostly chicken and fish,but I find that many veggies bloat me and make me very gassy and thus in pain later on.Im writing to you as Im really confused.I dont know what to follow anymore.You hear gluten free,you hear paleo and then I think of my dad who had a quadruple bypass surgery last Xmas and was forbidden any kind of fat and meat.There are those who say meat is really bad especially if you get constipated and I really do not know which way to go.Does it sound liek IBS and if it does or not how long would I have to follow it to see if it works for me.Did you have that problem too or any of your readers.I feel energetic and alright but when the cramping and tightness in my abdomen happens,Im totally different person and feel so achy that I refuse to go out and have fun a lot.Please tell me if you can which way should I go and if Paleo sounds like the thing for me,I will go to my local store and purchase the book.Thank you. I would definitely say that getting started on a basic Paleo diet is a great first step. I would say to start with the 30-Day Meal Plan for digestive health specifically if you want further details on which direction to take. Thank you.I guess it can’t hurt more to try. Your story sounds similar to mine…as I am sure it is to many others. I struggled with baby fat all thru high-school, fell into the low fat/no fat diet in the late 80s/early 90s and exercised to no avail. Slowly packed on the pounds until pregnancy where I gained 70 during and 25 more after. In the 11 years since, I have lost 30 to 50 pounds several times only for it to spring back on very quickly. I’ve been diagnosed with Hoshimoto’s & hypothyroid (can’t have gluten), PCOS, Iron anemia, adrenal fatigue, scaley dry skin and a genetic disorder that causes clotting. I’ve seen numberous types of doctors…all with different theories. I finally found a Naturopath who has been the best help yet, but I can’t afford to continue to see her in this economy. I have a HUGE amount of stress in my life and suffer from severe depression…exacerbated by my frustrations with my inability to lose weight. I mostly eat whole foods and drink water. I know I eat too much dairy (crave it) and wonder if I may have an allergy to it. I ran across the GAPS diet on the internet this morning and in my research on that subject, kept coming across Paleo references. I went to a bookstore and ran across your Paleo book…spent a long time perusing it, but it is a huge stretch on my budget. Bottom line….I have 120 pounds to lose and will be fighting my family every step of the way to do so. This way of eating sounds wonderfull for correcting health issues, but how well does the Paleo diet work for direct weightloss and what is a common amount to lose per week? What can a severly obese person expect to see by making these changes? If you are dealing with several health conditions, weight loss should not be the #1 focus. Focus on eating foods that create a healthier body, and the weight will come off when your body is ready to let go of it. Eating real food (Paleo, as it were), will absolutely help you do to that. Thanks for sharing! Your story is so similar to mine. I’ve had hypoglycemia for as long as I can remember. Also very athletic in High School and friends teased me about not being able to skip meals 🙂 My senior parking spot said “Breakfast, Lunch AND Dinner” because I could never skip a meal. 🙂 I gained weight and got bad acne in college. Got married, had 4 kids and lost the weight by being super active and eating “clean.” But, still felt like I was in the “skinny fat” stage and still having bad hypoglycemia. Started Whole30/Paleo a couple months ago and started feeling so good. I recently had lab work done and found out that I probably need to stick with Paleo forever because I have a lot of issues. Of course confirmed I have Hypoglycemia/Insulin Resistance, low thyroid, very low immune globulin, flipped hormone ratios, dairy allergy and possibly celiac (more tests need to be done). But, I’m glad I know what I need to do. I’m excited to have found your site. Can’t wait to look around and learn more from you! Thanks!! Wow. I just want to say wow to you Diane. I’m always wildly impressed with women who can pull themselves up (the way you did jumping, then grabbing part of the ceiling and lifting your whole body). We (us ladies in general) don’t have that upper body strength without a lot of work. Did you work specifically on your upper body strength when you started lifting weights? I moved from the Bay Area down here to LA, so I can imagine your gym setting in SF. It does look like a fun environment. I’ve been a part of 24 hr fitness since my late 20’s (gosh about 20 yrs) and I can ‘hang’ on something that I can lift my legs but not lift my whole body with my arms – and I’m the thinnest I’ve ever been at the moment (5’4″, 113lbs – anti-candida diet). I guess it’s like us Jewish girls and thighs. I couldn’t be thinner and still they’re there (smile). I’m enjoying your book. Thanks for all the colorful, simple nuggets of health information well beyond just a recipe book. Yes, it took lots of training to be able to do pull-ups! The trainer I worked with in San Francisco got me there over the course of time. I knew it and I bet you did work at it for a long time. You definitely work hard Diane that you even pop in on this blog and facebook. I was going to ask you a question from page 64 on HCl that I hope you don’t mind I’ll ask you here. I know I have to give a little of my background so I apologize it’s a little long. I’m mercury poisoned mainly from dental amalgams (I hope you don’t have any today or ever had them – seriously evil toxin). I’m the picture of health from all that I’ve done from my nearly every day gym exercise to my pretty good (not perfect but a lot of whole, organic foods) diet, my supplemental nutrition (because I knew mercury was doing lots of nasty things like messing with my enzymes), doing my best to remain calm (ignoring LA traffic), helping others with mercury issues (because unfortunately I’m not alone), etc. Diane, I dream of being in balance – fully – and I’ve known I’ve not been for probably a couple decades but definitely the last eleven years since this MS diagnosis (blah blah – neurologists can call my mercury poisoning whatever they want – if I had listened to them, I would be more toxic today with their nasty drugs). I have spent years patch working problems and the one I want to heal the most – that hurts me profoundly – has eluded me, until now. My insomnia. It’s awful and it’s always been complex or I would have figured out the solution by now. This brings me to…I knew the connection with mercury and candida but six months ago had definitive evidence (saw the fungal form of candida). Now why didn’t I pursue this years ago? It’s my health. Seriously. I have had lousy sleep for years and I rarely get a cold. I know it’s all the good things I do that I fight this toxin continuously so I don’t ‘see’ the problems as easily. I literally am an example of what you’re trying to tell everyone with the good work you do – that yes, you bet. You want health? Eat well (and exercise regularly – not too much but consistently) and add some extra nutrition. It works and in this case – works too well. I did have sugar cravings but as I chelated more mercury out it lessened and I didn’t have other obvious candida issues. I am so confused about HCl. I must have leaky gut given the candida and the undigested food I see in my stools. Do you know if it should be rare that we see even white specs? Sometimes it’s plenty obvious, other times it’s just very small white specs. My other chronic issue is constipation. I never have any pain, I didn’t know for years it was an issue until I read that I didn’t ‘go’ enough. So on the one hand, I must have a leaky gut, I know I knocked down fungal candida (it’s wild but several lab tests improved dramatically including my ferritin levels after 7 weeks of natural antifungals). I take several cleansing pills to keep things moving and that pill includes gut healing licorice, slippery elm and marshmallow. Can you have ‘mild’ leaky gut? On HCl, I’ve experimented taking 10 HCl capsules with a protein meal and I felt nothing. No burning. Nada, zilch. I thought that would mean I have low stomach acids. It never entered my mind until I read what you wrote on page 64 that if I didn’t have a burning feeling, that I ‘could’ have a healthy gut lining. Now I’m confused. I had fungal candida, undigested food in my stools and constipation. Yet I’ve been unwittingly taking gut healing herbs for a long time. I have no clue if I do or don’t have low stomach acid and if I need to treat it. Just from your experience, what do you think? Do you know of a test that’s reasonable (as if I could ever get that capsule test to check my stomach acids)? When I’m back from traveling next week, I’m going to do peppermint oil and more berberine for the SIBO. It just has to be the cause of the bloating. I’m a creative problem solver so I’m guessing and hopefully later I can do the breath test. Diane, if you have any thoughts or suggestions, thank you. I’m so close. I’m closing in finally on my sleep problems. I still have lots of chelation ahead of me, but if I could just sleep like a normal person, nirvana. Pingback: How to quit sugar | How to quit sugar. I often feel hungry very soon after eating, often it is what I consider to be a pretty healthy meal. Do you have combinations you suggest? Protein with carbs? Protein with veggies? I feel like I am on the same path of just trying to figure out what works for my body. I just found some blogs you wrote on meal planning and prepping and realize that is probably where you include this information.